Sooooo many people have asked me for updates on each of the kids. I thought I'd start with Audrey since I found something today. On April 15, 2014 I posted this picture on Facebook. Doesn't she look like an angel? I don't remember this dress, though Dean says it was sent to us by a friend of mine. I really don't remember much of Audrey's first 6+ months home. Lost in a chemo-induced fog, going through the mechanical motions of each day. Taking care of the kids between naps. Feeding the kids between naps. Sitting outside, trying to soak up some sunshine until I could excuse myself from life for another nap. I do remember one day in particular when I was trying to potty train Audrey. WHY in the WORLD did I choose THEN to potty train her? Did you all think I was crazy? Someone should have slapped me. Anyway, I had underwear on her and a potty chair in the middle of the living room. I was doing my usual "no pants" day, which is how I potty train my kids. Suddenly I thought, "Why don't I have a pull up on her instead of underwear? Yes, she might take longer, but I can barely get off the couch much less constantly be cleaning up puddles on the floor." Such a simple thought, but one that was so difficult for my brain at the time. Audrey was fully potty trained just a few days later. My friend Ann came to help me on a couple of my really bad days. I remember sitting outside in the fresh air so thankful my friend was there when I had to make several mad dashes to the bathroom. And she brought me desitin which I desperately needed. I have to go back and look at pictures to have any idea of Audrey's progress during those first months home. I know from videos that her communication took off, and she was so excited to have a way to tell us what she wanted instead of just pointing. Her love for music is something to be reckoned with, and she can usually be found with an iPhone in her head, and occasionally a small blue-tooth speaker that she can carry around the house. Although, it doesn't really matter if there is no music playing at a give moment, because Audrey has a song in her head at all times. She never stops dancing her own little jig, singing some crazy tune that often sounds like a Native American spiritual dance. She has been so very happy and excited to see the world. But a couple of months ago things started to change. I'm not sure exactly when, as we were a bit pre-occupied with Angela and probably not noticing some of the more subtle changes. Finally, there came a day when I said to Dean, "I think that Audrey is regressing." It is very common for kids with Down syndrome, as well as post institutional kids, to make big gains, then regress a bit in one area while they're working hard on another. Kind of the "two steps forward, one step back" concept. Two weeks ago we had Audrey's IEP meeting. We discussed some changes to her programming, and I expressed my concerns about just teaching her to function in the world, and lets worry about the academics later. Audrey is developmentally around 16-18 months old, and kids that age aren't sitting at a table learning letters and numbers. Her classroom staff is excellent and in complete agreement. They know what they're doing, and I'm so thankful to have staff working with my kids who truly do approach teaching as a team effort! Anyway, I also brought up my concerns about regression. Her teacher made it clear that Audrey has regressed in every single area. So, here is where I tell you the hard parts about parenting Audrey, and to remind those adopting for the first time that the child you bring home may not be the child you have a year or two down the road. When Audrey came home she was SILENT. I knew she liked to sing because she did it with her foster family in Serbia. I figured the whole language barrier and new sounds she was hearing was too much for her to process. But now, a little over a year and a half home, Audrey is SO VERY LOUD!!!!!! Oh my word!!!! She chants. She sings. She screams. (not like a girl screaming when they play. This is a self-stimming noise that goes right through my spine!!) And when she screams a certain scream she is sent to "sit in the circle", while she laughs hysterically at our attempts to reign her in. She has also gotten very aggressive and will kick, hit, bite, pinch, scratch, spit, tackle, and put other kids into headlocks before you can process that is what's happening right before your eyes. While she smiles at you and bats her eyelashes. Thankfully she saves most of her aggressive behavior for school, laughing at staff's attempts to make her stop. I say "thankfully" not because I'm glad she's naughty at school, but because...well...it's 6 1/2 hours less per day that I don't have to keep an eye on her. We love this child fiercely, but we also need a break for the eyes-on supervision she needs at all times. I am pretty sure Audrey was a stripper in another life because she is so very good at being dressed one second, and when I blink my eyes she is naked. Or wearing someone else's pants. Maybe even the pants that person was JUST wearing and she has managed to get them away and onto her own body. While I blinked. This child can vaporize and re-appear in totally different clothes as we all sit here wondering what the hell just happened. Stripping can happen anywhere, such as while we wait in line to see Santa. And I am holding her hand. And without ever letting go. I listen to her sing and feel her dancing around as I talk to the people next to us, when I suddenly realize they are looking down with their mouths hanging open And so I, too, look down to see Audrey smiling the biggest smile at me, and her jacket and shirt are now hanging from our joined hands. And her pants are at her ankles. And where the hell are her shoes and socks??????? This is something that happens multiple times per day. And don't even try to say, "You must not be watching her close enough" because it happens at school too, where she has a 1:1 staff person with her at all times. On the bus she is strapped into a harness for the 3 minute and 42 second ride home. When she arrives she is usually missing her jacket, shirt, shoes, socks and is working on her pants when they arrive at our driveway. How is she even able to do this strapped into the harness? One of her best moments was when I had a county person here for a visit for one of the kids. Audrey was outside jumping on the trampoline when I ran to answer the door. When I ran back to bring the kids up to the house Audrey naked, laughing and jumping on the trampoline with wild abandon. I looked up to see the county rep. watching out the window, trying not to laugh. In addition to stripping, Audrey also changes clothes multiple times per day. We still haven't figured out if this is a sensory thing or a developmental stage. Probably a combination of the two. She will find anything to wear. I'm considering putting together a dress-up box for her, but really the "dress up as someone/something else" part is beyond her yet. She just wants to change clothes. I have taken all of the clothes out of her bedroom to save me having to pick up the mess of strewn clothes at the end of every day. Have I mentioned that Audrey is extremely hyperactive? 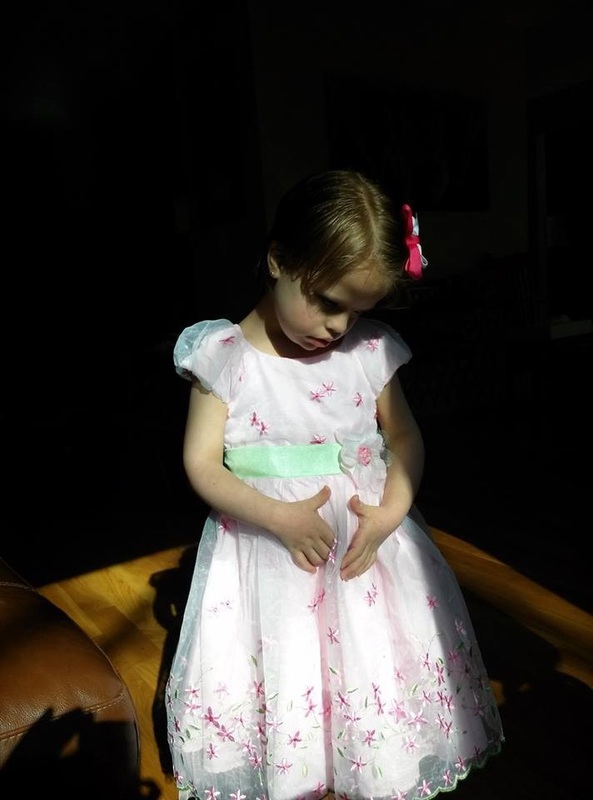 Now, Angela was very hyperactive when she was little, and there were many professionals in her life who, along the way, commented, "I have never seen a child with Down syndrome quite so hyperactive." Let me tell you, Angela was a sloth compared to Audrey. Remember the cartoon of the Tasmanian devil? This is Audrey, on one of her calmer days. Complete with the noises. And so, where Audrey is concerned, our focus over the next few months will be figuring out exactly what is happening in that pretty little head of hers. Maybe we won't find out at all (look, it took us 19 years to get Angela diagnosed!) but we have to figure out something to help her. She is not even functioning well in the world right now. In the meantime we're looking at moving her to a different program. Like I said above, Audrey's staff at school are excellent. But these kids with severe institutional delays, behaviors and attachment problems? They are no walk in the park and not everyone can be expected to know how to manage it all. We don't know how, and we sure can't expect her school staff to just know how either. Thankfully our district does have another option for Audrey, and I think it will be a very good fit for her. A place where she can learn to function in the world, and if she learns some academics along the way? That would be just great! So that is my update on Audrey. She really is a beautiful little girl, but man, she is a HANDFUL!! I'm so very grateful we have to parental tools needed to get her to adulthood. To help her become the most independent she is capable of being. To allow her to see the world in all it's glory while the rest of us run to keep up with her. Nice to hear a little update on Audrey, and glad your district has good teachers/resources to work with! My three year old is also a stripper, but thankfully not to the same extent. Most often it is either shirt or pants, though they frequently both come off at the dinner table, or if he makes a bathroom run. At a holiday party this weekend, he was playing with other kids and another parent came and informed me that he was pants-less, "for high speed", as he explained it!